Sage is a Mediterranean herb in the mint family that most Americans are familiar with as seasoning for Thanksgiving turkey and stuffing. The plant's history is much older than that of the New World, however, and is still a favorite ornamental and culinary herb in many Old World gardens and pantries. Its name literally translates to "prophet" or "wise one". Some etymologists speculate that this is because its branching can resemble a candelabra, an instrument that sheds light on what is hidden or unknown. In any case, this symbol of wisdom is as useful in tea blends, body powders, dental products and hair rinses as it is in poultry and stuffing seasoning. 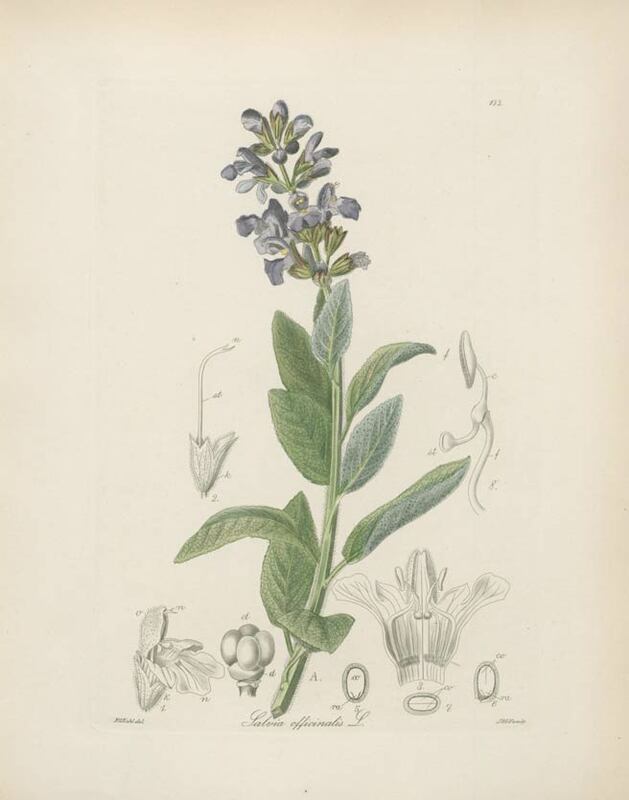 Salvia officinalis, commonly known as sage, is a member of the Lamiaceae family. This perennial, evergreen subshrub, produces woody stems, grayish leaves, and blue to purplish flowers. Sage cultivars vary greatly in size, color of leaf and flower, as well as foliage pattern. They can have many variegated leaf types. The Old World type of sage reaches approximately 2 feet (0.61 m) in height and width. Most commonly it boasts lavender colored flowers, but they can also be white, pink, or purple. The plant flowers in late spring or summer. 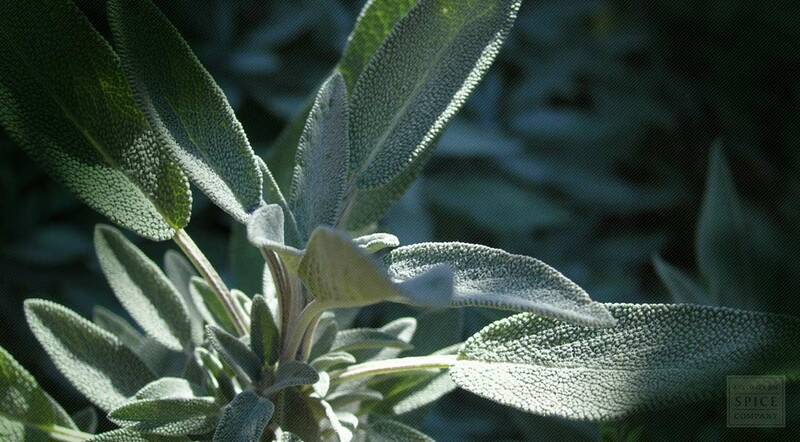 Sage leaves are oblong, ranging in length and width up to 2.5 inches (6.4 cm) by 1 inch (2.5 cm). Leaves are grey-green colored, rugose (wrinkled; corrugated) on their top sides; and due to the existence of many short soft hairs, nearly white underneath. Modern cultivars include leaves with color ranges of purple, rose, cream, and yellow in many variegated combinations. The genus name salvia means “to save”. The specific epithet officinalis refers to plants with a well-established value. Salvia officinalis is native to the Mediterranean region, though it has naturalized in many places throughout the world. Sage grows on sunny dry banks and stony places. Is usually found in limestone areas and often where there is very little soil. Requires a very well-drained light sandy soil. Sow seeds in a greenhouse in March or April. Germination usually takes place within 2 weeks. Transplant out the seedlings into individual pots when they are large enough to handle and plant them out in early summer. The leaves are best harvested before the plant comes into flower and are dried for later use. Store whole dried sage leaves, cut dried sage leaves, powdered sage leaves and other varieties in an airtight container in a cool, dry place. Sage is a common herb in the kitchens of anyone who enjoys cooking. It’s used most often to add spice to poultry and other delicious dishes. And while sage provides wonderful flavor to meals, it has even more important uses in the world of herbal medicine. In fact, it has a variety of uses you may never have heard about. Sage is a good overall herb also known as a tonic herb to help improve your health. It generally boosts your energy and helps your immune system to work better. It can also help you to feel relief from stress and tension that comes from every day difficulties and busy schedules. Externally, sage can be used to treat insect bites. The fresh leaves can be applied directly to the skin to give this relief. It will help to soothe the burn and diminish pain and swelling. When you’re suffering from a sore throat, sage can be used in a mouthwash or gargle. It will help to relieve the pain that often accompanies colds and other infections. It will also be a good remedy for mouth pain such as ulcers and blisters that can affect the delicate skin. Sage can also provide a reprieve from the complications of asthma. It helps to reduce the symptoms so you can experience more time with good health. For women’s health, sage has some very important roles. It is estrogenic, which means it affects the hormone levels of estrogen in the body. Sage can actually help to regulate the menstrual cycle. You’ll have fewer problems with missed periods and it can also affect your menstrual flow. If you’re making the transition to menopause, sage can help to reduce symptoms such as hot flashes and sweating. For the digestive system, sage also has implications. It can help to treat problems with diarrhea. It will slow down the intestines and allow them to absorb nutrients and water so that you won’t experience dehydration, cramping, and frequent trips to the bathroom. You can use sage leaves in an infusion or a tincture to get a concentrated dose that provides the best health benefits. You can also add a high quality dried sage herb to your favorite recipes to enjoy the flavor of this delicious herb. And fresh leaves can be used to treat irritations from bug bites. Sage is so useful; it’s a shame to keep it hidden in the spice cabinet. Pull it out and use it for the many health improvements it can provide.